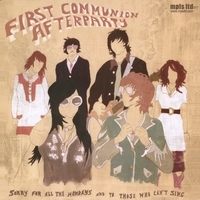 First Communion Afterparty is a group of kindred souls who came together to satisfy the need to create modern psychedelic rock. Immediately after their first live performance in the summer of 2006, a local hype began to snowball. A combination of sheer ambition, youth, and an undeniable passion for a musical revolution, FCAP have evolved their sound into multi-instrumental psychedelia. The band has received several best new band mentions in the local press, and performed in Austin TX at SXSW for the last two years. \"Sorry For All the Mondays and To Those Who Can\'t Sing\" is a long-awaited album thrillingly akin to exploring a familiar place in a brand new light.